Hong Kong: Lenovo Group Ltd , the world’s No.2 PC brand, posted a better-than-expected 88% rise in second-quarter profit, helped by acquisitions and an increase in sales in emerging markets such as China. “Uncertainties over global economic recovery, the renewed debt crisis in Europe, and tablet PC cannibalisation of entry-level consumer PCs remain," Lenovo said in its earnings statement. On Wednesday, Lenovo reported a profit of $143.92 million for the second quarter ended September, up from $76.59 million a year earlier. The result beat an average profit forecast of $118.3 million from eight analysts polled by Thomson Reuters. 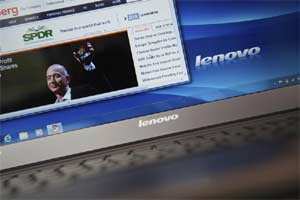 In June, Lenovo agreed to buy Germany’s Medion AG in a deal valuing the German company at up to $900 million, its biggest acquisition since its purchase of International Business Machines Corp PC business six years ago. Lenovo, one of China’s best-known consumer brands, had a 13.7% share of the global PC market in the third quarter, according to research firm IDC. Lenovo’s Hong Kong-listed shares, which have risen 12.45% so far this year, gained 4.87% on Wednesday, versus the Hang Seng Index’s 1.88% rise.